Our winter sale is here just in time for the remainder of the Holidays! Why not continue some of our Black Friday Sale Savings! It's a great time to get your car ready for the New Year - add that beautiful exhaust note, or that improved suspension you’ve been lusting after! Maybe you have had your eye on those new wheels, or even our signature TAG Painted Blackout-packages /Reflectors for a new look! This is a great opportunity to head into the new year with a new touch on your ride! 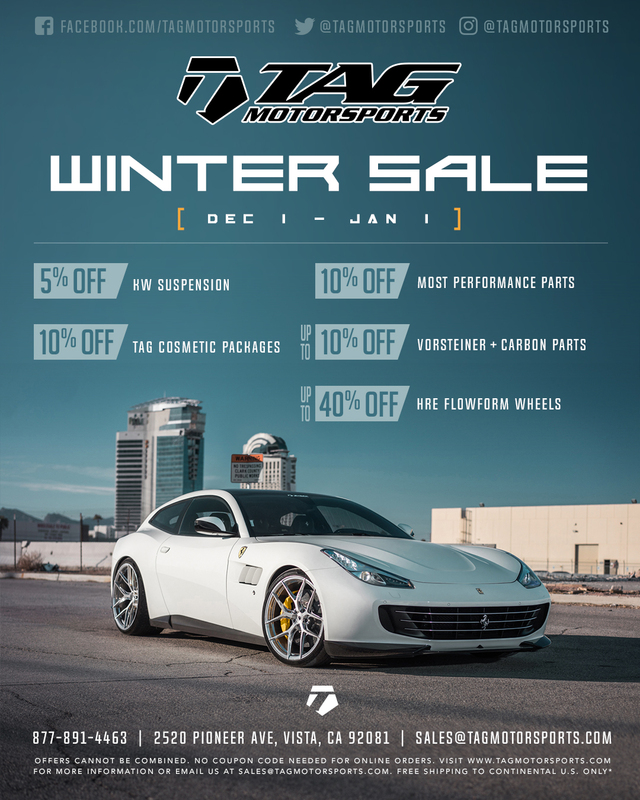 Always remember, call one of our knowledgeable sales representatives (Insert website phone number) or email us at sales@tagmotorsports.com if you have ANY questions at all! Let’s keep this holiday spirit rolling! Happy Holidays!